Read on to discover how easily KeyLines can integrate with Vue to bring powerful network visualization to your application. Vue comes with several powerful features – including a virtual dom, binding framework, templating engine, a router, server-side renderer and more. But it’s also very flexible and can be very lightweight, allowing you only to use the features you need for your application. We’ve published a KeyLines-Vue component, which is really just a wrapper around the KeyLines API. Once this has been loaded into your application, you can work with KeyLines as a regular API or use Vue to bind chart data directly to forms. It all starts with some data. 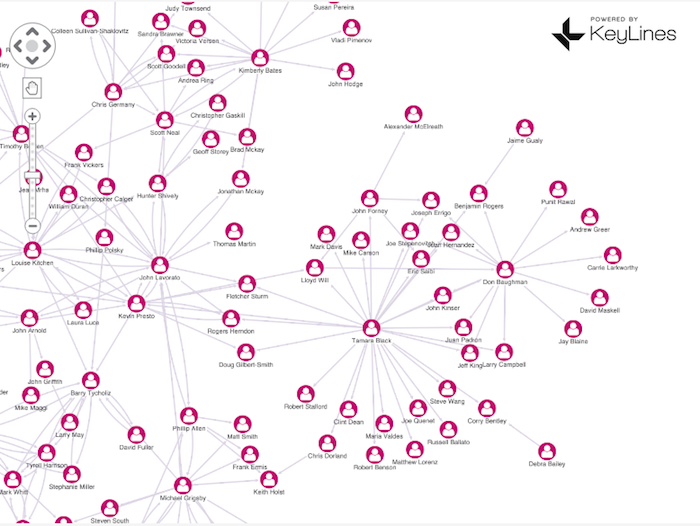 KeyLines is agnostic as to what backend data comes from – maybe from a graph database or some pre-formatted JSON. In our demo, we’re going to use data from the Enron emails network. We need to assemble and download this data outside of Vue: for now, we’ll just assume it’s available in a variable called chartData. KeyLines provides a Component to simplify integration with Vue, making it easy to load the chart a with declarative rendering. This code is written in ES6 using features widely supported by modern browsers: but the equivalent code will work in ES5, too. Or you can use a transpiler process like Babel to convert it into native ES5. This renders and lays out our JSON data as a beautiful network of nodes and links. I won’t go into detail here on building you KeyLines UI, but you’ll find inspiration and full demo source code on the KeyLines SDK site. A common use-case when viewing the chart is to display data related to each node, often by showing a form next to the graph and updating it when the user selects a node. We can implement this very easily using Vue by binding data on the node directly to the UI. 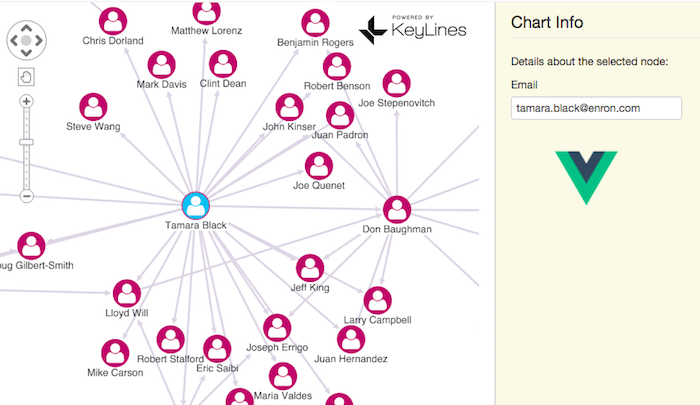 We can also use built-in features of KeyLines to reduce the amount of data visible on-screen. For example, we can use the combo API to merge or group nodes with common properties. In the enron data set, for example, we can combine people based on their team (or department). And we can radically clean up our chart at the click of a button. Sign up for a trial to browse our API documentation and get a full sense of what KeyLines can do for your data. This post shows how easy it is to integrate KeyLines with a Vue application. KeyLines also integrates with any backend – all you need to do is convert your source data into JSON and pipe it into KeyLines. Start a trial today to access the source code for our existing Vue demos and use them as a starting point. You’ll have access to the Vue component, as well as KeyLines itself.